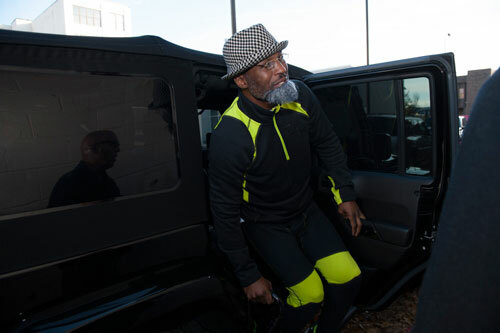 Bernard Hopkins, 55-7-2, 32 KOs, held an open media workout Monday at the Joe Hand Boxing Gym in Philadelphia, and entered the event dressed as an old man – an older old man than he actually is, that is. 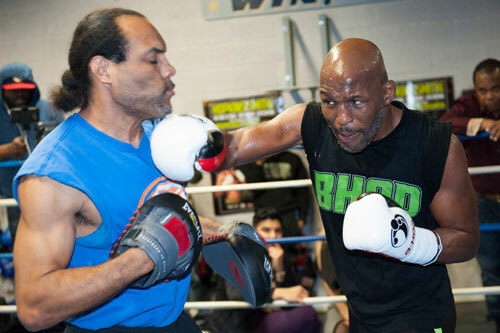 The nearly 52-year old worked out before for a large media contingent with trainer John David Jackson and assistant trainer Danny Davis. Hopkins also answered questions from the press, most of which regarded whether or not his scheduled 12-rounder with Joe Smith Jr., 22-1, 18 KOs, would indeed be his final ring appearance. 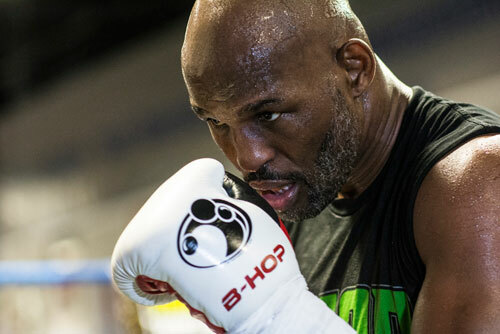 Both Hopkins and promoter Oscar De la Hoya, who was also in attendance at the workout, have gone on the record with assurances that Bernard would retire from boxing after the fight. “I believe him,” De la Hoya said. “I believe this is going to be his final fight. We’re calling it “The Final 1”. 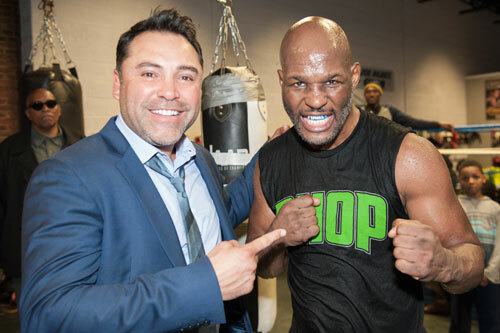 We actually had him sign a contract, and it states in the contract, ‘I promise this is my last fight’,” De la Hoya said with a laugh. His opponent, Joe Smith Jr. is a 27-year old puncher who shocked Andrzej Fonfara six months ago by knocking him out in the first round. The New Yorker will look to build on that victory with an even more surprising win, designed to retire Hopkins for good. The fight will be held at the legendary Forum in Inglewood, CA, and will be nationally televised by HBO.